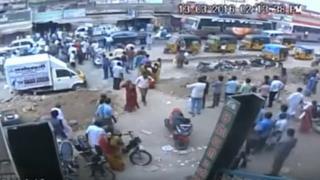 Six people have been sentenced to death for the murder of a man from India's Dalit community in an "honour killing" in Tamil Nadu last year. Sankar, 22, was hacked to death on a crowded road in broad daylight. People watched in horror as the attackers then fled on a motorcycle. He was murdered for marrying a woman from a higher Hindu caste, police say. She was also injured in the assault. Dalits, formerly called untouchables, are at the bottom of the caste system. The bride's father, who handed himself in and admitted to carrying out the attack, was one of those sentenced to death. Eleven people stood trial in the case. Apart from the six death sentences, one man was sentenced to life in prison while another got five years in jail. Three others, including the bride's mother, were acquitted of all charges. In 2011, the Supreme Court said people convicted of honour killings should face the death penalty. An image of the woman, identified as Kausalya, sitting up in her hospital bed with bloodied bandages went viral in India.